It's clearly a little early, but for some reason I had the burning desire to make some sangria. 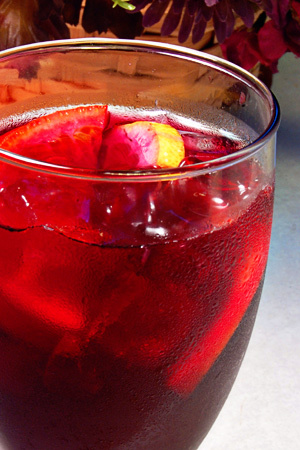 I like wine and sangria is just a great way to lighten up some red wine. It's a winey, fruity, refreshing and festive drink. Oh, and it's brain-dead easy to make. You can use any red wine for this recipe, but I recommend something full-bodied, like a Merlot. You want the wine to be bold enough to stand up to the fruit and ice. As for brands, I really like Barefoot. The quality is worth about three times the price. Combine the wine and sugar in a large pitcher. Add the fruit and stir gently. Just before serving, add the ginger ale and stir. Serve over ice in a large wine glass. Tip: Roll the fruit on your counter under the palm of your hand before slicing. This will help release the juice and oils.